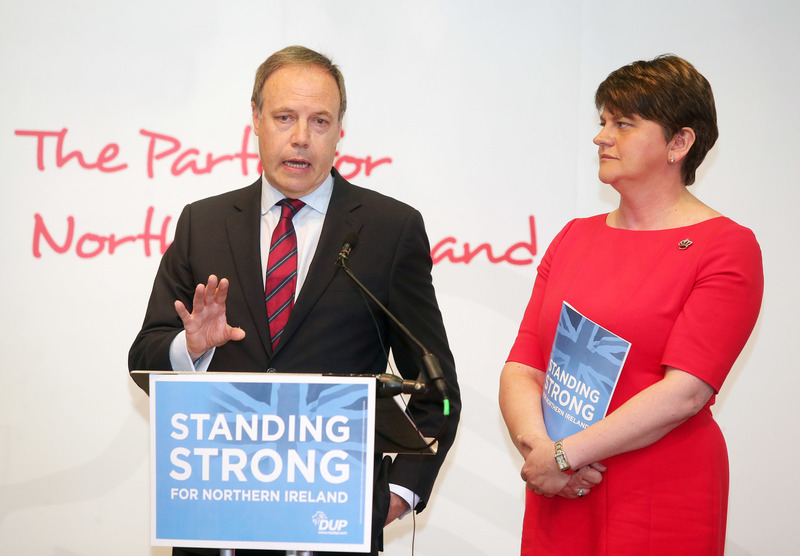 London-based commentator Matthew O’Toole, a former No 10 spokesman, looks at the DUP's role in the Brexit process in light of the publication of the draft agreement on the withdrawal of the UK from the EU. Of all the hostility Theresa May received in the chamber of the House of Commons last week, Nigel Dodds’ intervention must have been the hardest to endure. Yes, Jacob Rees-Mogg coldly threatened to write a letter of no-confidence in the Prime Minister (and subsequently did so an hour later), but Mogg is a pantomime act, albeit an ambitious one. And yes, hardboiled Brexiteers like Peter Bone and Mark Francois took pleasure in being rude to her face. But they are long-standing critics who wear their rudeness with pride. But Dodds’ words on the draft Withdrawal Treaty were different. He invoked private assurances May had given his party during the course of the negotiations, hinting at duplicity on her part. And of course he talked up the threat to what is now invariably referred to as the “precious union” posed by the backstop. The raw bitterness was undisguised. This intervention from the DUP’s Westminster leader will have been doubly insulting to May, who is both sincere in her unionism and careful with her reputation for stolid dependability. Neither party should be surprised at the other’s stance, yet both somehow appear surprised. Since there was no way the European Union was going to drop its demand for some Northern Ireland-specific backstop measures, the DUP could hardly have been surprised when these arrangements duly emerged. The party offered Theresa May precisely zero credit for negotiating concessions from the EU’s initial draft withdrawal text, which explicitly placed Northern Ireland in the EU’s customs territory. But rather than take credit for demonstrably shifting the outcome in their favour, as they have done, the DUP is determined to oppose the outcome to no obvious end. Rather than owning a compromise which they have shaped, they prefer to look like its victim. There was a time when Theresa May was able to offer DUP MPs all the bromides they wanted from the despatch box. In the spring, when the European Commission released its controversial original interpretation of the backstop May loudly declared that the arrangements were something “no British Prime Minister could ever agree to”. This may have created the impression among the DUP listeners that any version of the backstop would be resisted rather than finessed, always an entirely unrealistic outcome. In aggressively resisting reality, the DUP has found itself in coalition with the diamond hard Brexiteers of the European Research Group now attempting to bring down the Prime Minister who only serves at the pleasure of the DUP. Several of the ERG MPs who have submitted letters of no confidence in the Prime Minister have pointed to the alleged threat to the union – the ‘precious union’ - from the withdrawal deal and its treatment of Northern Ireland. Leaving aside the suddenness of their interest in the region, entirely absent is any attempt to offer a detailed alternative proposal with the slightest chance of being taken seriously by the EU. Like the DUP, the ERG specialises in tactical confrontation rather than strategy. Likewise, they share a refusal to concede to reality when it threatens to dilute the intense purity of their vision. The most implacable leavers have left Government rather than concede the ultimate truth of Brexit: that Britain needs a deal more than the EU and is mostly a supplicant in these talks. That statement is not intended as a harsh criticism but as a cool assessment of the balance of power. A country of 60 million people voluntarily exiting an organisation which will still have 450 million members is inescapably the weaker party – even allowing that the EU still has an interest in a close relationship after Brexit. It should hardly be surprising that the DUP feels an affinity with ERG refuseniks railing against the arithmetic of power. Just a few months before the party signed its supply and confidence arrangement with the Conservatives, unionism in Northern Ireland become a minority for the first time ever, receiving less than 50 per cent of the vote in the devolved assembly elections. The unionism that the DUP espouses is demonstrably a minority sport in Northern Ireland, yet they are willing to assert every ounce of their power to preserve it. The same is true of the ERG’s nihilistic version of Brexit. There are probably still majorities for both the union in Northern Ireland, and a majority for Brexit across the UK as a whole. The DUP and ERG share an unwillingness to see the limits of these majorities, and the extent to which forcing confrontation on the basis of a minority vision will put at risk their entire cause.